Founded in 1974 as the West Farms Land Trust (WFLT) we are now called the Waterford Land Trust. 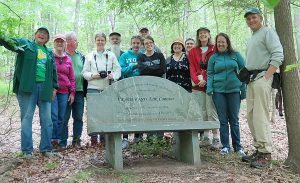 As the 48th land trust in Connecticut, it was formed by local residents striving to preserve the natural charm of the undeveloped lands and irreplaceable resources of Waterford and Montville. Our incorporators were Katherine Lenhart, Lois Pond, Sally Taylor, and Joseph Pereira. From the Kashanski’s 1974 gift of five acres of land, WFLT has grown to over 348 acres held in fee, under easement, or under management. We are a private not-for-profit organization dedicated to preserving and protecting the natural resources of the town: land, water, plants and animals, as well unique scenic and historic sites. We manage the properties we acquire for the benefit of the public for educational, recreational, conservation, and scientific purposes, and for their historic value. Donors may give outright or discounted gifts of land or other assets, or may grant us conservation easements while still holding title. The original name is rooted in local history. During the 17th and 18th centuries, “West Farms” was the term used for the land now known as Waterford. The center of the colony was situated where New London now stands. The farm land and wood lots, given by English grants to early settlers were west of the colony’s center; hence the name West Farms.